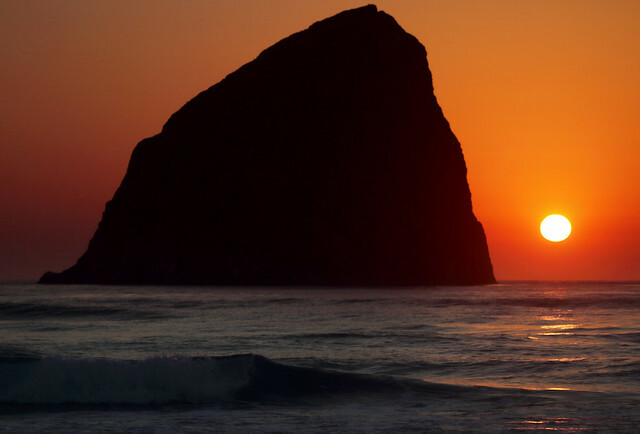 Pacific City Sunset | Flickr - Photo Sharing! Räi, Mr is Me, SF knitter, and 54 other people added this photo to their favorites. Excellent shot of an icon. Beautiful sunset image. A stunner. Those formations are so very distinctive, and you've presented this one beautifully as a silhouette against that golden sky and perfectly positioned sun! Wonderfully done! wonderful view! great mood! beautiful colour tones and reflections! Wonderful shot. Beautiful colours and lovely composition. The orange sky is spectacular! I like the way how you have positioned the sun. You did a marvelous job of capturing this beautiful moment, Kurt! That is totally amazing!!!! I really like the way you capture the rock! Gorgeous exposure work and silhouette on this scene. Beautiful reflective light streaming across the water and fantastic colors in the sky with a beautiful tonal range. Beautiful work! Quite a massive rock dwarfing the sun. . . a fantabulous moment, Ian, (who's Kurt?). . .really spectacular photo!!! Splendid sunset , great presentation ,Ian ! Spectacular Ian! I love your composition, atmosphere, and those colors. Quite the catch. This is a wonderful shot ! !